To continue our We Tried it! 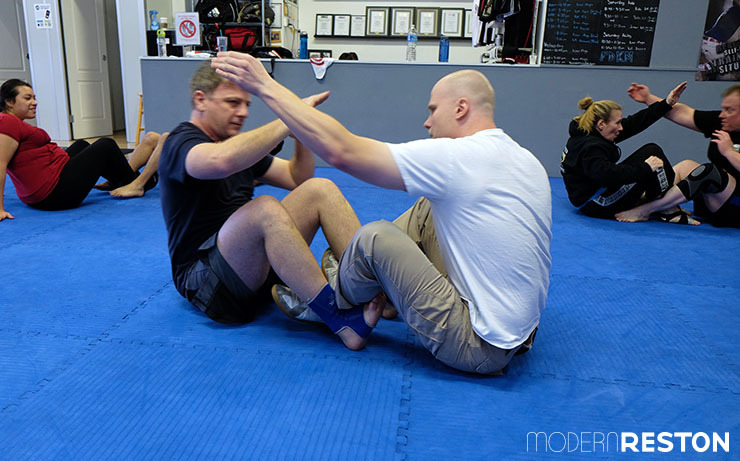 series, guest contributor Charlie Schoening subjected himself to a month of classes at First Defense Krav Maga in Herndon. Maybe he can tell us what the heck Krav Maga actually is! Krav Maga is an Israeli martial art primarily used for self-defense. The objective is to end a confrontation quickly and decisively using elements from boxing, judo, wrestling and aikido. More recently the techniques have been picked up by law enforcement and the military. However, you don’t need to be a commando to reap the benefits of this fun and exciting form of self-defense. The author, left, warms up with a partner. 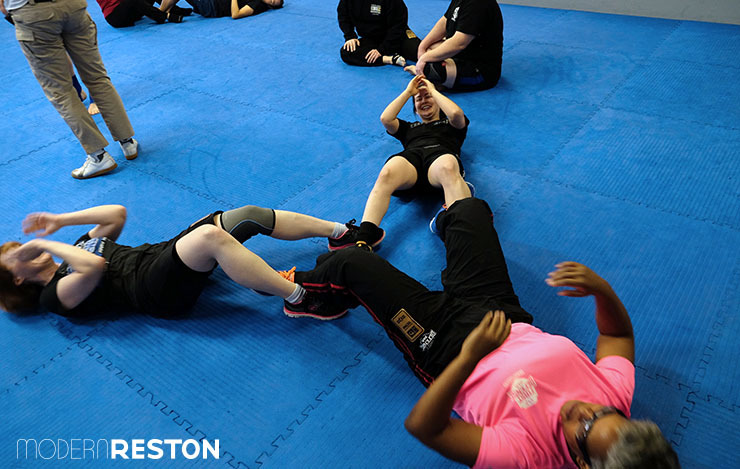 Krav Maga can be particularly useful for women, or for parents who want their teens to know how be safe in dangerous situations. First Defense offers a number of classes throughout the week and I was fortunate enough to get a sampling of them during my trial month. 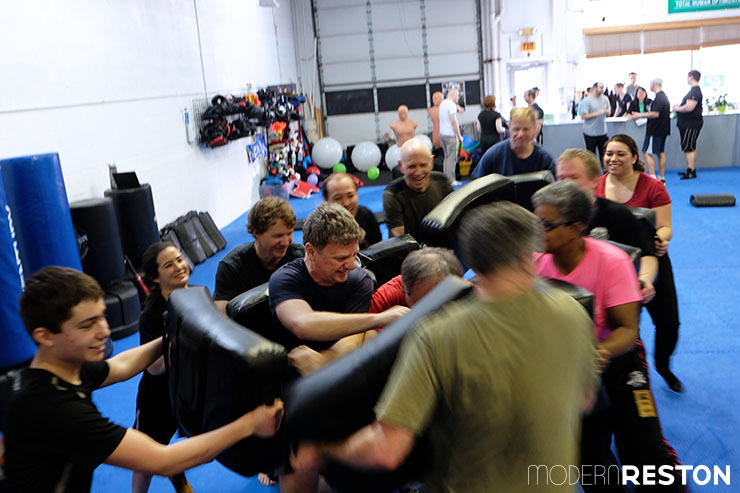 It all begins with Krav Basics taught by Nick Masi; the other co-owner and Ann’s husband. He is an Expert Level 1, which is similar to a black belt in Karate. 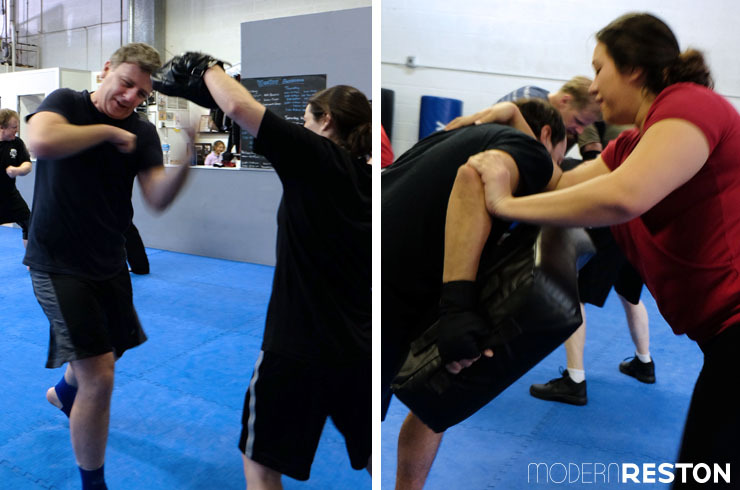 Nick is incredibly knowledgeable about Krav Maga and delivers that instruction with patience and expertise. Instructor Chris Murphy demonstrates a sequence of moves. Krav Basics was a great introduction to the practice and taught me some rudimentary strikes, a proper stance and how to block attacks. The practice builds upon itself as you advance through training. It’s pretty rigorous and I realized quickly that this dad bod was woefully out of shape! To get my mojo back, I tried the KM Fit class taught by Lauren. She took me through several reps of squats, push-ups and lunges. The workout woke up dormant muscle groups and left me sore for a couple of days. Over the course of the month I learned more of the basics like striking, awareness of my surroundings, and how to react in a hostile situations. In one class in particular, I learned three ways to get up off the ground and either fight or flee a situation. The last class I took was KM Strike/Fight. This class involves sparring and is not for the beginning practitioner. Luckily, I have a background in martial arts so the owners allowed me to participate. It is a great class that reminded me of my days in the ring, but there were a few exceptions. 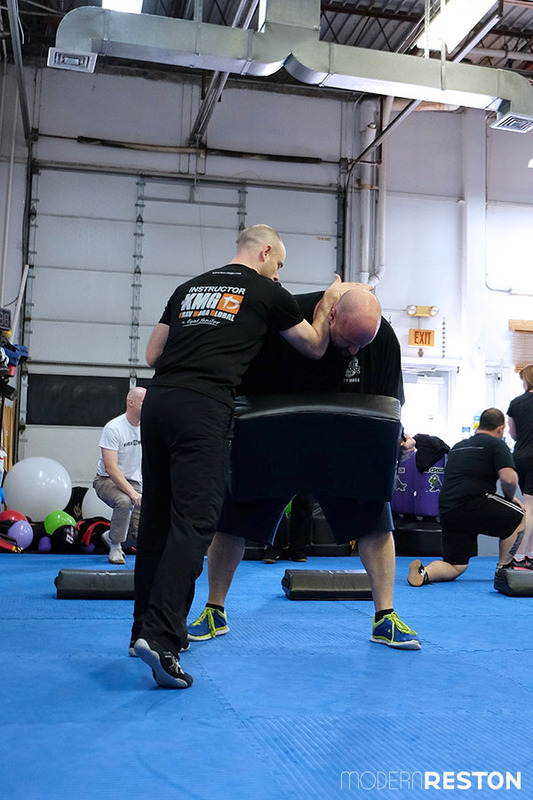 Krav Maga is about ending a confrontation quickly and decisively, which loosely translates into street fighting (or no rules). For example, I was not used to defending groin strikes… A word of advice to any guys considering Krav Maga — wear your cup! The month passed by quickly and I regained some of my cardio in the process. However, if you are looking to lose a lot of weight I recommend supplementing this workout — First Defense teaches a focused skill and they teach it well. Everyone I met at First Defense was friendly and interesting and they put a big emphasis on family. Kids were always around, either taking classes or watching their parents. 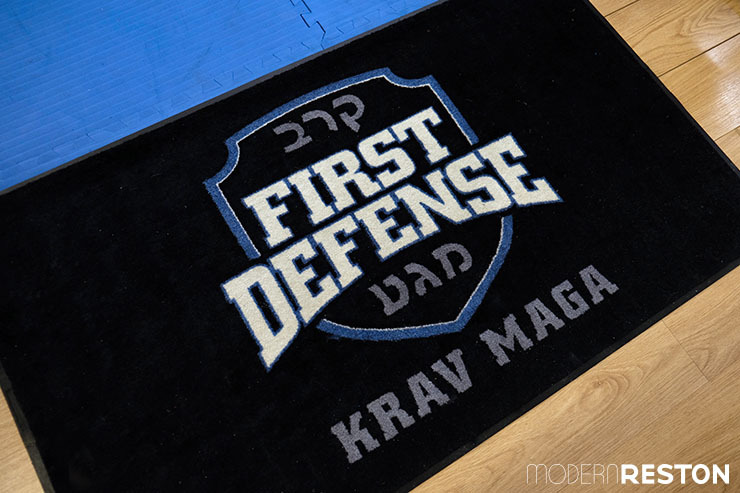 First Defense also offers KM Advanced and Teen Krav Maga as well as kids’ classes. Details are available on their website and the staff is available to answer any questions you may have about your first class.